Issue 7.10 is now online! This month’s issue contains three Applications articles and two Open Access articles, all of which are freely available. – CODYN: New analytical tools applied to long-term data demonstrate that ecological communities are highly dynamic over time. The R package, library(“codyn”), helps ecologists implement these tools and gain insi–ghts into ecological community dynamics. – Geometric Morphometrics: A tool for the R statistical environment that optimises the smoothing procedure for 3D surfaces used in Geometric Morphometrics. – TRAPPER: Open source, multi-user software that facilitates analysis of videos and images, provides spatial filtering and web-mapping, allows flexible implementation of specific data collection protocols, and supports data re-use and (re)discovery. This month’s first Open Access article comes from Michele Dalponte and David Coomes. In ‘Tree-centric mapping of forest carbon density from airborne laser scanning and hyperspectral data‘, the authors develop a tree-centric approach to carbon mapping, based on identifying individual tree crowns (ITCs) and species from airborne remote sensing data, from which individual tree carbon stocks are calculated. An advantage of the tree-centric approach over existing area-based methods is that it can produce maps at any scale and is fundamentally based on field-based inventory methods, making it intuitive and transparent. ‘Identifying the best climatic predictors in ecology and evolution‘ by Martijn van de Pol et al. is our second Open Access article in this issue. In this article, the authors address the problem of identifying which weather variables, over which time period affect biological responses and in what ways they do so. A four-step approach that allows for more rigorous identification and quantification of weather signals – which is easily implementable with the R package ‘climwin’ is proposed. 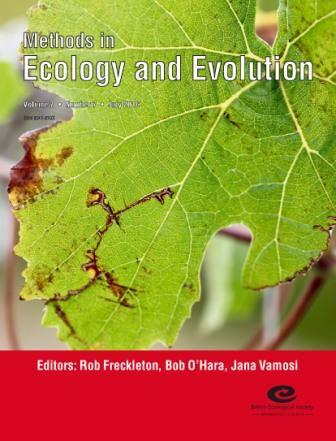 Our October issue also features articles on Species Phenotypes, Monitoring, Disease Ecology, Population Ecology, and more. This month’s cover image shows a Mountain-yellow legged frog (Rana muscosa), an endangered amphibian living in high elevation lakes and streams in California’s Sierra Nevada mountains. This species has experienced drastic population declines across its native range largely due to the devastating effects of the amphibian chytrid fungus. This fungal pathogen infects the skin of amphibians as they reside in their aquatic habitats, eventually leading to amphibian morbidity and often death. In the related article – Integral Projection Models for host–parasite systems with an application to amphibian chytrid fungus – Wilber et al. build a novel framework for linking individual-level measurements of host-pathogen interactions to population-level predictions of epizootic dynamics. They use this modeling framework to gain insight into the temperature-dependent dynamics of chytrid fungus-induced Mountain-yellow legged frog declines. It can also be used to understand the dynamics of other diseases of conservation concern such as white-nose syndrome in bats and facial tumour disease in Tasmanian devils. This entry was posted in Journal updates and tagged Camera Trap, Chytrid Fungus, Climatic Predictors, climwin, CODYN, community ecology, ecology, Epizootic Dynamics, evolution, Forest Carbon Density, Host-Parasite Systems, Integral Projection Models, Morphometrics, Mountain-yellow legged frog, R, TRAPPER, Tree by Chris Grieves. Bookmark the permalink.